To those who’ve been wondering what was going on, or who have asked us for updates on how the strike was going, apologies for the delay in getting this out. This article is the product of many one-on-one conversations with Stoney Creek Towers tenants, a ‘rent strike review’ mass tenant meeting, and internal discussions amongst members of the Hamilton Tenants Solidarity Network who supported tenants in the campaign. On Wednesday, February 13th, hearings concluded for the AGI application brought forward by InterRent REIT and their in-house property management firm, CLV Group. 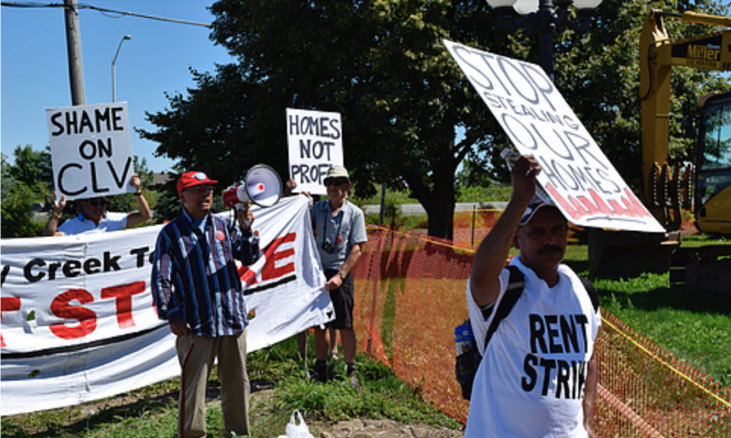 These proceedings, held at the Royal Canadian Legion Hall on Limeridge Road, represented the formal end of a campaign that saw tenants at the Stoney Creek Towers collectively withhold their rent as part of a seven month-long rent strike. That rent strike itself concluded on November 19th, soon after the first round of AGI hearings was adjourned. At that time, tenants submitted - via their lawyer, Kevin Laforest - an initial proposal for an increase of 4.2% above the guideline, spaced out over three years (in contrast to the 5.38% above the guideline, spread over two years, that InterRent eventually ended up asking for). This compromise would have allowed InterRent to recoup the majority of the costs claimed on their application, while allowing tenants a bit of breathing room in terms of managing the hike to their rents. These terms were reached through internal discussions of the tenant committee’s elected negotiating team, and subsequently approved by majority vote. The striking tenants saw this as a reasonable offer with which to begin direct negotiations. In fact, most saw the proposal as a significant concession and a gesture of good faith on their part. InterRent's posse of landlord executives, lawyers, consultants, property managers, and public relations spin doctors at the Landlord and Tenant Board Above Guideline Increase hearing, held at the Royal Canadian Legion in November 2018. Unsurprisingly, this good faith gesture was not reciprocated. For weeks, CLV stonewalled the tenant committee and ignored repeated emails from Laforest. The only confirmation that they’d received the offer at all came from a statement given by the company’s chief PR representative, Roseanne McDonald-Holtmann to The Hamilton Spectator on November 29th, in which she claimed that CLV was ‘currently considering a response’. That response came on January 4th, in a condescending, passive-aggressive letter to Laforest, in which CLV’s chief counsel, Martin Vervoort, made it clear that his client would not be coming to the table. As insulting as the letter was, the decision itself was not particularly surprising. It had been foreshadowed by CLV staff’s increasingly arrogant and vindictive behaviour towards tenants following the end of their rent strike - conduct that has since escalated to include retaliatory action, including threats and attempts to evict former strike captains. We have always been clear that because of the way the legislation is written and interpreted, tenants have no chance of defeating an AGI in the courts. CLV’s letter came after we heard that the Landlord and Tenant Board (LTB) had secured the Legion Hall for four full days to ensure a conclusion to the hearing and avoid any chance of a second adjournment. So at that point, it was already clear that InterRent would be getting their rent increase. Carry out long-overdue repairs to tenants’ units. At this point, we can definitively state that the primary demand was not met - and therefore, ultimately the rent strike failed. We see little point in trying to polish that up. Together, tenants and HTSN organizers took on a Real Estate Investment Trust (REIT) worth over 1.7 billion dollars. We fought to block a legal rent increase. We fought hard. It went through anyway. As a result, many low-income tenants will have less money to spend on groceries, and some may be forced to move out. It’s brutal. All we can do is take stock of what went wrong, learn from our mistakes, and do better next time. But as sobering and disappointing as this failure was, there were also significant material and political gains won as a result of the strike, which is why whenever members of HTSN have described the outcome as a loss to tenants, we’re generally reprimanded and reminded that they still consider it a win. Why? First of all, the second demand was largely met. Many tenants have had long-neglected repairs made to their units, and they see this as a direct result of the pressure of the rent strike. Windows and balcony doors were replaced ahead of schedule, and many tenants who experienced lack of heat in their units in past winters due to drafts are now enjoying the warmth. Tenants have received new appliances (including one family who’d been using the same stove and fridge since the 1980s); a few had their entire kitchens or bathrooms redone; others had floors re-tiled, holes patched, walls painted, and pests treated. This includes many 'legacy tenants' who InterRent was attempting to push out of the buildings through targeted neglect, in particular elderly tenants, people with disabilities, immigrant tenants, racialized tenants, and those without a strong command of English. For many tenants who’ve been requesting repairs for years and have been repeatedly ignored, this is huge. They have a renewed sense of dignity and pride in their homes. Beyond these repairs, the four buildings are now well-organized, and there is a strong basis of trust and solidarity between tenants. A working-class, organizational culture has developed, and it will continue. Neighbours who lived on the same floor for years without learning each others’ names are now friends. They support each other in filling out work orders and following up to make sure repairs are completed. They help with translating notices from the landlord or the LTB. They help elderly tenants carry down their garbage and laundry and to prepare their units for pest treatments. They hold regular meetings to discuss common concerns and plans of action. They understand that their shared interests are directly opposed to those of their landlord. They now know exactly who their landlord is, and the role that REITs like InterRent play in profiting off the housing crisis. Stoney Creek Towers tenants are angrier than ever before about landlord harassment, disrepairs, and rent increases, and they are fired up about building their collective power and the potential power of working-class people in their neighbourhood. For our part, HTSN members have learned a great deal throughout this process. This was our first time organizing a rent strike and we made mistakes. For months, we’ve been holding collective and one-on-one discussions, reflecting on how and why things played out the way they did and what we could have done differently. We won’t list these lessons here, as we don’t want to give any free tips to landlords. But suffice it to say, HTSN organizers have no intention of squandering the experience we’ve gained, and encourage other groups and individuals who are interested in carrying out similar types of organizing to reach out, so that we can share any insights that may be of value. Members of HTSN and tenants from the Stoney Creek Towers were incredibly moved by the support that we received from working-class people across Hamilton and beyond. Thank you all so much. Over the course of the campaign, hundreds of supporters donated to the Rent Strike Defense Fund, attended rallies and social events, participated in solidarity actions, offered to translate flyers, organized or attended fundraisers, bought a hot dog at a rent strike BBQ, or a copy of The Steal City fundraising EP, donated banner materials and art supplies, created original art, and shared updates on the campaign through their networks. It meant a huge deal to Stoney Creek Towers tenants to know that working-class people across Hamilton identified with their struggle and were cheering them on. With your help, we reached our fundraising goal of $20,000 for the defense fund. When a landlord makes an application to the LTB to evict their tenant, the tenant can be ordered to pay the landlord’s filing fee (either $190 or $175, depending on how it’s filed). The defense fund ensured that no tenant would need to pay this fee themselves in the event that InterRent took her to the Board, meaning that no tenant would be financially penalized for participating in the strike. Having a healthy strike fund encouraged more tenants to join. Over the course of the rent strike, we spent over $17,000 on filing fees. The idea of handing over thousands of dollars to the LTB honestly makes us pretty sick, and in hindsight we obviously would have done things differently. But that’s what the fund was for, and paying these fees helped allow tenants to keep the strike going for seven months, and helped ensure that none of them were evicted for withholding their rent. Additional funds donated to the rent strike also allowed us to drive a rented school bus full of tenants to Ottawa to take their demands directly to InterRent’s head office (as employees cowered inside and called the cops) and to one of InterRent/CLV CEO Mike McGahan’s two mansions, which was one of the definite high points of the campaign. We’re still waiting to make sure that there’s no outstanding expenses associated with the strike before closing the books, but the surplus remaining will be used to assist in further organizing efforts, either in the Stoney Creek Towers or in other parts of the city. To learn more about the East Hamilton Rent Strike campaign, watch the videos below and read through our past blog posts and Hamilton Tenant newsletter issues. I don't have time to do it here but would be great if you could make those edits. Cheers! Fixed, thanks! Fwiw, vidoes embedded using the square brackets thing seemed to show up for me, just in a slightly smaller window than they do using this method?